what can i start with to show you guys what this blog is all about? well lets start with two look party dress! To start you need a fleece that is the biggest size you can get even if it can go up to xxl, (the one that i used was a large), a lining type fabric polyester or satin if you want to use that ( i actually used an indian suit for mine) and a t-shirt if you want. 1.first cut the sleeves off, just before the seams, you can actually use the left overs to create a really kool vest!! 5.fold the fabric back along the forn until you get the desired size you want and pin the back, do not cut at this point. 6.then on the back of the fleece you will see a large sqare shaped piece of fabric just before the sleeve bottom start, cut and remove that piece from the fleece and this will be the skirt. 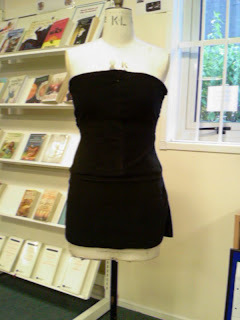 7. drape and pin the skirt to the bodice bit on the dress form and have both the end nearly meet at the back. 4. the mark two line coming off the marks at an angle to how full you want the skirt and draw a curve to join the lines together. 5. cut out the shape leaving on inch for seam allowance. back to the dress! using some scrap bits of the skirt fabric attach that to the end of the skirt on the dress, remember that was not close when you where sewing!! 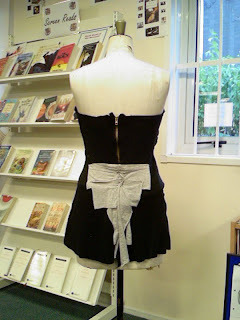 also if you want to add any other left overs to the back of the dress to create a nice bow detail. and then all you need to do it put the skirt with the zip ontop of the dress and you have two looks perfect and a night out!! what is fashion fix remade? 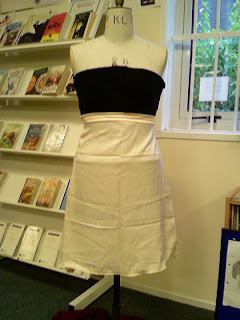 This is my first blog people so i hope you like it : ), well i guess what your wondering is what is fashion fix remade? well it is my alternative to commercial fashion, in this blog i will show you different ways to personalize clothes and accessories aswell as making and remaking clothes, which no one else will have!! Also i will be talking about clothes on the runway and taking a look at the new trends and what they can offer as well as getting you reading for any occasion with some very simple but affective style tips.